Here I am on my first floating home. Note the graceful stern. 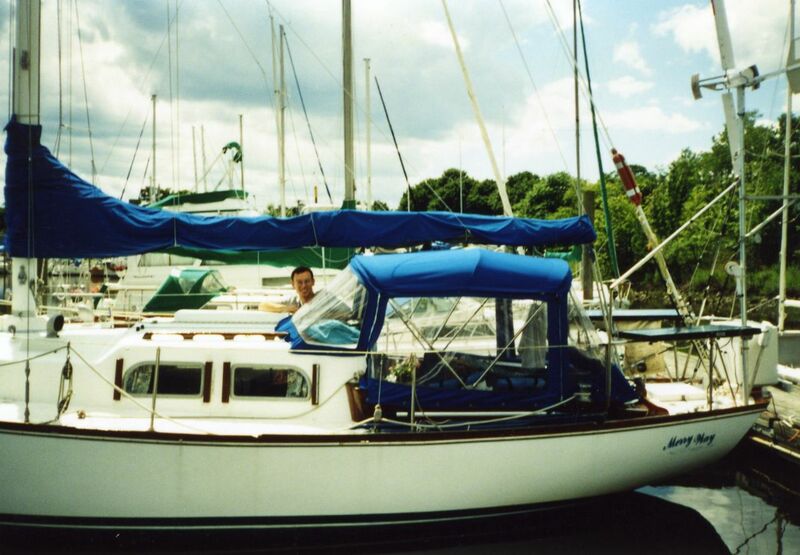 My first cruising keelboat, a very experienced Pearson Vanguard named Merry Way, played a big part in shaping my current opinions about what traits are truly desirable in a cruising sailboat. Merry Way wasn’t exactly the boat that I had wanted at the time, but she was the best boat that I could afford. As it turns out, to this day she was the most expensive boat that I have ever owned. Where to spend my cruising funds was one of the things that she taught me–an important lesson, as these days I don’t have nearly the money I did when I was working full-time as an engineer (as I was when I bought Merry Way). LOA-32′ 6″ LWL-22′ 4″ Beam-9′ 3″ Draft-4′ 6″ Displacement-12,000 lbs (actual weight; brochure lists 10,300 lbs) Sail area-437 sq ft. Sailors spend a lot of time looking at those numbers for different boats and comparing the numbers from one boat to another. They give a pretty good overall feel for the size, heft, and power of a boat. In this case, one of the things that can be seen in the numbers is that the Vanguard has long overhangs–the difference between the LOA (Length OverAll) and the LWL (Length WaterLine). The Vanguard’s overhangs are over 10′, or almost a full one-third of her overall length. That’s a lot of boat hanging in space above the waterline just looking pretty (and I admit that it felt great to be told how beautiful my boat was by passers-by!). When it comes to a cruising sailboat, however, all of that overhang is mostly just wasted length. It is true that the stern wave will come up under the counter (stern overhang) of a boat like this to increase its apparent waterline when it is moving, allowing a higher top-end speed for the boat, but that be achieved more effectively by just getting rid of the overhang and actually lengthening the waterline by design. The long overhangs were put there mostly to help the boat achieve a favorable rating under an old racing rule. The characteristics that caused me to grow to dislike the long overhangs of the Vanguard affected everything from the maintenance to the sailing, and even the habitability of the boat. The first thing that I noticed on my trip home was that the long overhangs contributed to “hobby horsing”–where the boat tends to pitch when traveling into a sea. Rather than just riding up and over the waves, the bow would first soar up into the air, and then then plunge down in the troughs, adding an uncomfortable element to the already uncomfortable exercise of trying to sail or motor upwind. The excess pitching slowed the boat, prolonging the agony of having to endure adverse conditions. Merry Way often behaved like a rocking chair, with the bow continuing to rise and fall even after a wave had passed. The pitching was made worse by having cruising gear such as anchors and solar panels near the ends of the boat, but storing gear near the ends is necessary on a cruising boat. I tried to put only light objects there, but even a few pounds contributed to the problem. Maintaining the boat was more difficult because of the overhangs. Keeping the hull clean in the area where the stern overhung the water required feats of acrobatics. That area needed frequent cleaning because of water splashing under there which caused algae to grow on the topsides. I spent hours hanging upside-down from my legs while I reached way under the back of the boat to scrub off weed and grime. I tried doing it from the dinghy, but couldn’t reach all of the hull. I tried a brush on a stick from the dock, but the long lever arm reduced my scrubbing pressure to almost nothing. It was easy to clean when the boat was out of the water, but that only happened once per year. Hanging over the rail was the most effective method of cleaning that area of the hull, but I always ended up with bruises for days afterwards from draping my body over the edge of the boat. I have heard others complain about the noise made when wavelets slapped under the counter, but I didn’t mind them. Every once in a while, though, a big wake or an ocean wave would get under there with a solid thump that was impossible to ignore. The overall effect of having a boat with long overhangs in a cruising boat is to cause the boat to become apparently smaller. The ends would optimally be kept empty to avoid hobby horsing, but that isn’t practical. Waterline length is reduced–even if the stern wave comes up under the counter, the bow still has unused overhang not contributing to waterline length. This reduces the speed potential of the boat, as the longer the waterline length of a boat, the faster it can move through the water (we’re talking about displacement boats here that don’t get up on the surface of the water and plane). Basically, the Vanguard is functionally similar to a heavy 25-28′ boat. This isn’t all meant to sound overly negative. I lived with the quirks of the Vanguard for a few years and sailed many enjoyable miles on that boat. The sweeping overhangs paired with the beautiful sheer drawn by Phil Rhodes are beautiful to look at, and that is worth something. The Pearson Vanguard is a pretty good sailing boat if she is kept light, especially in the ends. It is still a reliable, old-school racer/cruiser design that can be pressed into more serious cruising service, if one is willing to accept the tradeoffs.